This is a warming yet light, nutritious meal, and quick to prepare. 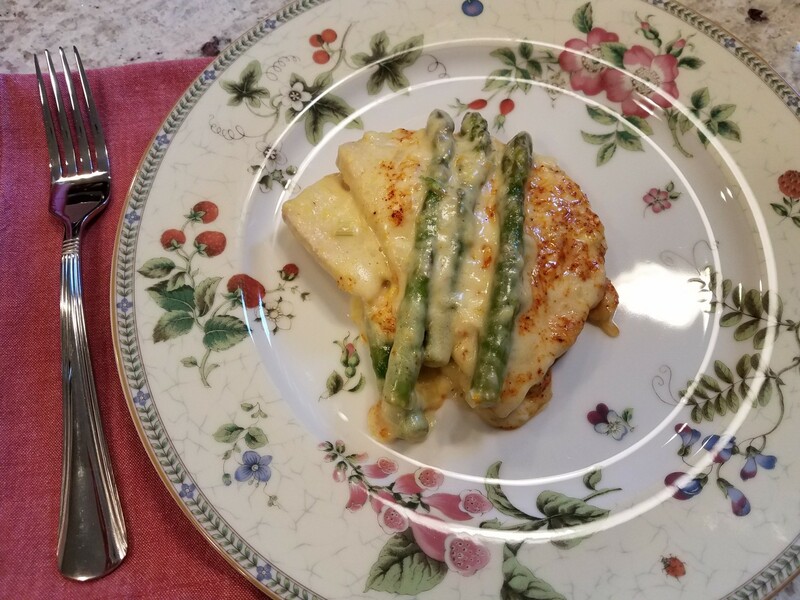 Turkey Asparagus Bake is a lovely dinner or brunch. You can whip this up with 20 minutes hands on time. It works nicely as leftovers for a fast weekday breakfast or any other meal. Fresh fruit makes a lovely complimentary dessert. ¼ cup chopped spring onion. Green onions make a good substitution if spring onions aren’t available. 3 Tbsp gluten free oat flour. Spelt and amaranth (gluten free) make good options. 1 cup whole milk or half and half. I don’t recommend nut milk because the flavor will be sweet. 1/3 cup vermouth or dry white wine (optional). Use broth if omitting the vermouth or wine. 1/3 cup grated Swiss cheese. Gouda and fontina make good options. 8 slices turkey breast cooked. Use the best quality and thick slices. Avoid any processed thinly sliced packaged meats. Lightly butter an 8 X 8 glass baking dish. Blanch asparagus for 3 minutes. To blanch, bring a small amount of water (just enough to cover the asparagus to a boil) reduce to simmer for 3 minutes. Remove from water and place in buttered baking dish when done. Melt butter in saucepan over low heat. Add onions and sauté for a few minutes until just tender. Add flour, stir for a minute. Slowly add milk and vermouth, whisking constantly over low/medium heat. Don’t let it boil, rather bring to a low simmer, continue whisking until sauce thickens, about 8 minutes. Add dry mustard and whisk to blend. Add Herbamare®, and pepper if desired. Add cheese and gently stir until melted. Place turkey slices over asparagus. Pour sauce evenly over turkey. Sprinkle with parmesan cheese and lightly dust with paprika. Bake for about 20 minutes until bubbly, golden and heated through.